Not long ago, I posted about the Mother’s Day gifts of the growing kind that I received in May. [Houseplants Beware] In that post I shamelessly revealed my infamous reputation as a serial plant killer, and that no conscientious person should place a living, healthy plant in my care. 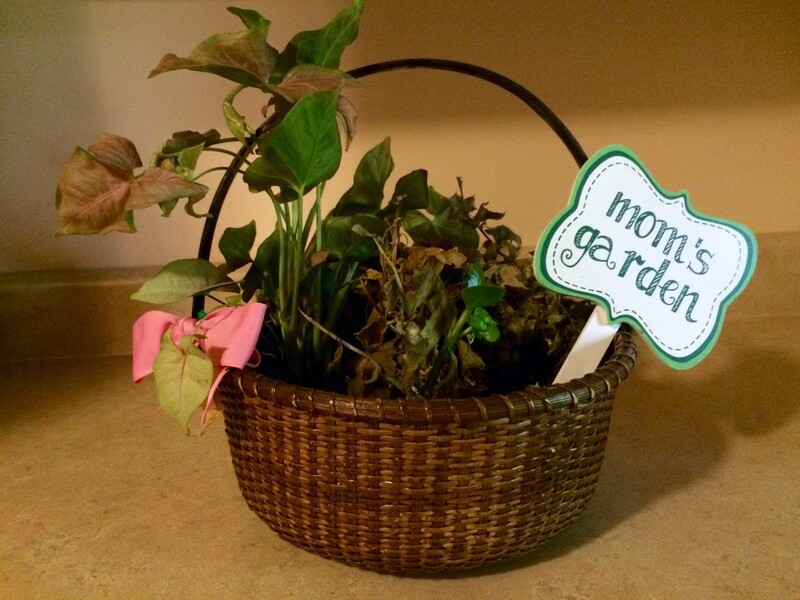 Despite foreknowledge of my herbicidal tendencies, Firstborn and family sent me a “Mom’s Garden” basket containing a variety of indoor plant life. 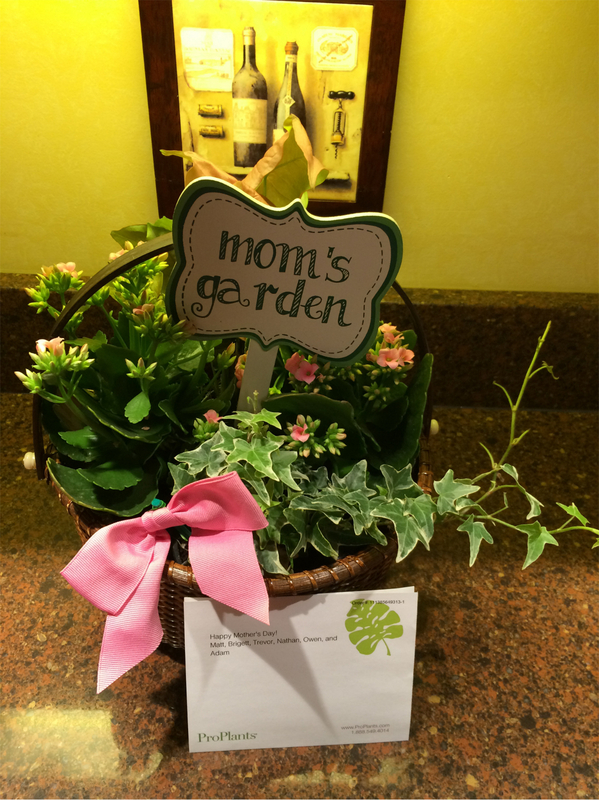 His Little Brother and family sent me two outdoor hanging baskets containing colorful flowering plants. One would think that sons of mine would know better. I regret to inform everyone out there that the woman with the black thumb struck again. A Mother Robin [The Squatter], who is no relative of mine, correctly predicted the ultimate fate of the hanging basket flora. She built her nest atop the flowering plants in one basket, no doubt expecting they were bound to die anyway. 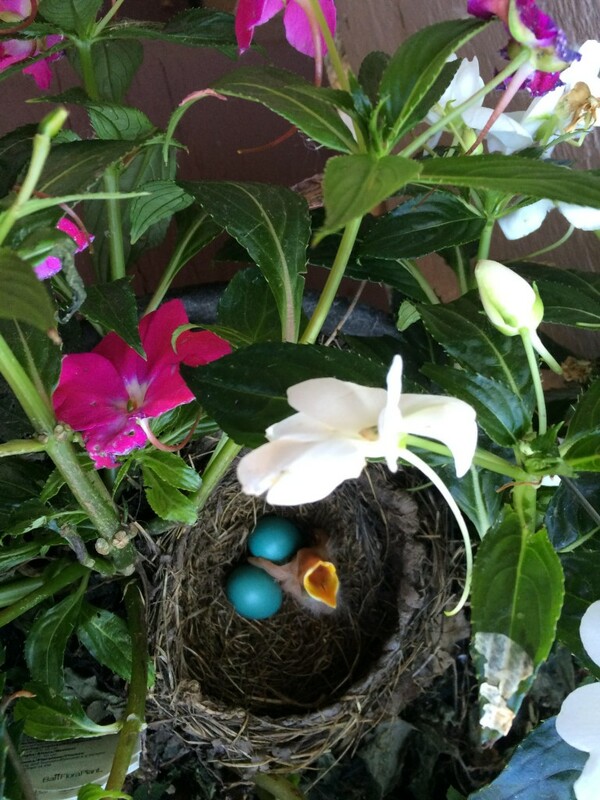 I posted a photo of her nest and the lovely blue eggs. 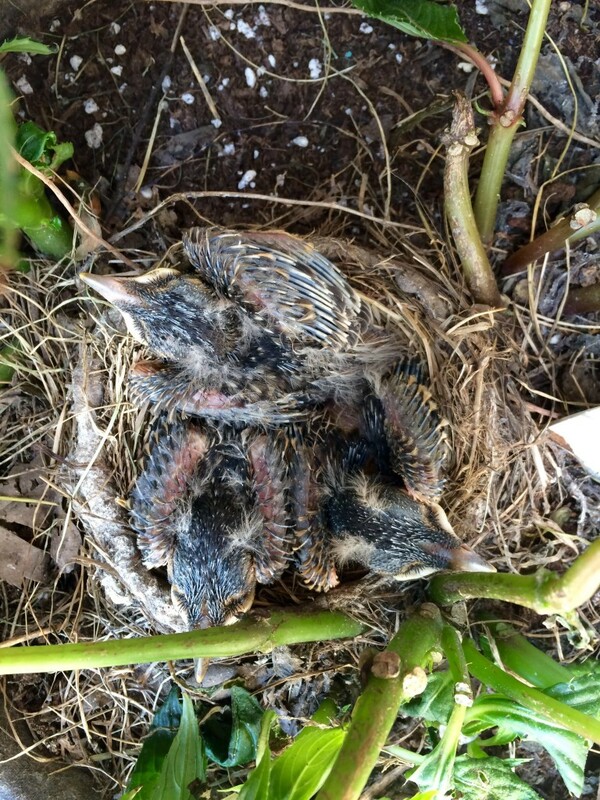 Here it is again, along with the photos of her baby robins. 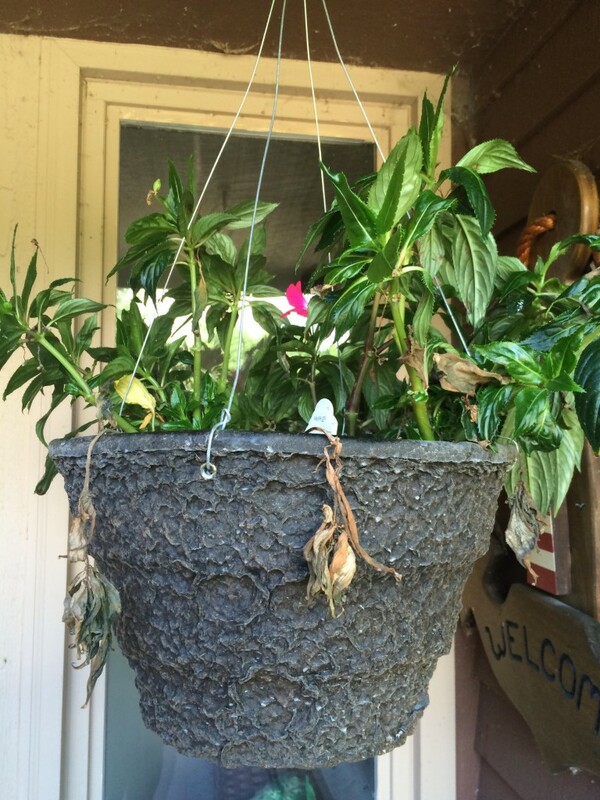 Here also is a photo of the terminally ill hanging basket flowers, soon to depart this world for a better place. Remember the blow-by-blow account of upgrading our hall bathroom? [Decor Wars Down at the Home Depot] Well, Kiddies, I managed to steer Macho Guy in the right direction in all ways but one. White and chrome is our color scheme for the hall bath. The tub/shower is white with chrome hardware. The porcelain facility is white. Both the wall cabinet and the linen floor cabinets are white with chrome inserts in their glass doors. The vanity mirrors are trimmed in white and chrome. The cultured marble sink/countertop is white on white. We were in agreement up until we approached the finish line: the sink vanity cabinet color. We elected not to replace the cabinet. I wanted to paint it white and refit it with chrome hardware so it would match the rest of the bath decor. MG wanted to leave it the original dark wood. He especially liked the cabinet doors, which were a better grade of wood than the rest of the cabinet and had a prominent wood grain he found extremely attractive. Everyone else who saw the vanity said the same thing: paint it white. MG steadfastly refused, until one day when he informed me he was going to paint the cabinet white. I was thrilled. I even did my happy dance mentally. I was so overjoyed that I did not listen carefully enough. MG painted the cabinet white as he said he would. He did not paint the doors. Can you believe it? He did not paint the freaking doors! 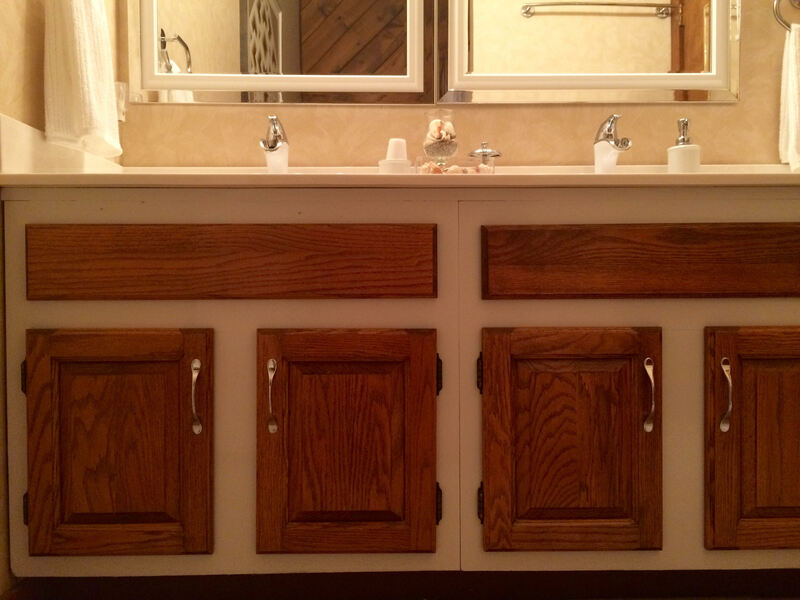 To my horror he replaced the doors just as they were—dark wood-grain doors on a white vanity cabinet. The hideous result made me physically ill. To add to my dismay was the knowledge that as the woman of the house I would be blamed for this horrendous decor faux pas. The horror! I photographed the revolting result and sent it to my two daughters-in-law. Their responses were similar: why did we go to the trouble and expense to upgrade the bathroom and not finish the job, and MG really wasn’t going to leave the vanity looking like that, was he? I had to assure them that, oh yes; he was determined to leave it looking like that. Here is a photo of MG’s abomination. Judge for yourself whether it should remain as is. It is my considered opinion that this vanity fiasco is more than deserving of being The Ugly component of this post update, and it is also an excellent example of why husbands should leave decorating to their wives. Thank you, Diane. You are a wise woman with excellent taste. Not a good choice… it makes the vanity look outdated. He certainly should paint them! Thanks for agreeing, Melissa. Sometimes I wonder if MG is color blind. I’ll suggest that to him. Thank you, Melissa. Fantasy Grows In My Garden Hey, Siri—Seriously?